I can’t have wine. I can’t have beer. I can’t go out. I’ve heard this from a few clients. I’ve read it and heard it from a few people online. When I started, it’s something that I said myself. It’s possible to still have a beer or a glass of wine and lose weight and create a healthy lifestyle. I kept alcohol in my plan during my last competition prep and saw the lowest body fat percentage I have ever had. This isn’t something many people practice, but in my last prep, it’s something I wanted to keep in for when I wanted a drink with dinner or date night. I wanted the ability to have a drink if I felt comfortable with having one work in my day. Alcohol consumption and weight loss comes down to a few things. Maintaining a caloric deficit consistently over time. Determining how you feel about the choice of having a drink. Weight loss/fat loss occur over time. While weight can fluctuate greatly day-to-day, true fat loss occurs over a period of time longer than a few days. You need to be in a caloric deficit over that period and that can be created through your nutrition protocol and workout programming. The mental aspect of dieting is something that I talk about heavily with my clients because I don’t believe in eating things you don’t like (you won’t adhere to your plan if you don’t like it) and you also need to be comfortable or at least ok with the ramifications (if any) of your choices. Why doesn’t alcohol have a nutrition label? How do I track alcohol? Should I leave space in my diet for alcohol? i.e. should there be an allotted number of calories or macros for alcohol to replace food? Before we answer these questions, let understand alcohol a little bit better. When we talk about alcohol as a consumable like beer, we’re meaning ethanol. Ethanol is a specific type of alcohol that you find in beer, wine and distilled spirits. Alcohol and ethanol are used interchangeably. Alcohol is technically a macronutrient. Chemically they are structurally similar to carbohydrates. Chemically, carbohydrates are C6H12O6 whereas ethanol alcohol is C2H5OH. Alcohol is similar to carbohydrates because they’re created from fermented carbohydrates in a process called ethanol fermentation or alcoholic fermentation. Alcohol has 7 calories associated per gram. This makes them more calorically dense than carbohydrates and protein, but less calorically dense than fat (Thompson & Manore, 2015). Ethanol is a specific type of alcohol that you find in beer, wine and distilled spirits. Alcohol provides no nutritional value, but it has energy. So, if it’s a macronutrient why isn’t it on a nutrition label? While the FDA and USDA are regulatory entities for food and supplements, they don’t regulate alcohol. That’s the short answer. Alcohol is regulated by the Alcohol and Tobacco Tax and Trade Bureau (TTB). This organization doesn’t require that companies provide nutritional information on their products. However, in 2004 a ruling called the Federal Alcohol Administration Act allowed TTB to implement labeling regulations as long as the information was accurate and not misleading to consumers. The FAA Act also had restrictions about marketing and statements in relation to benefits of alcohol. 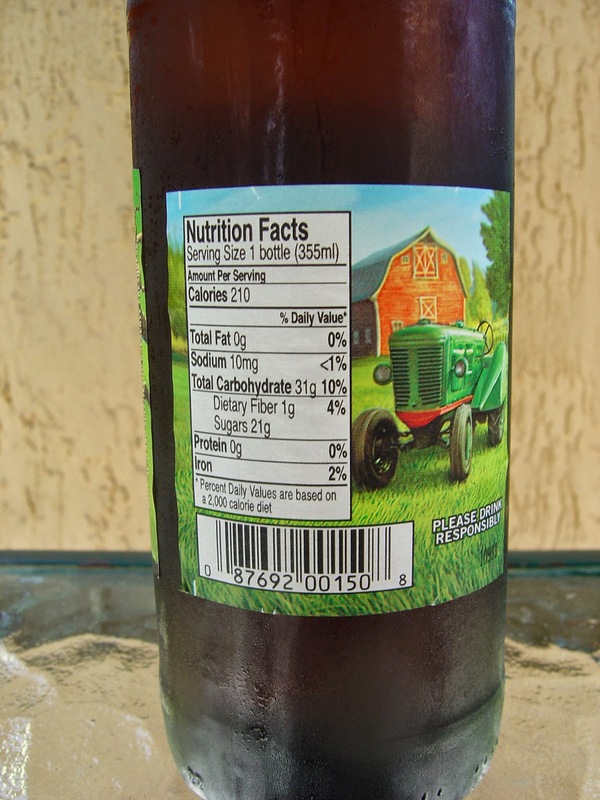 Since the FAA Action, more alcohol companies have tried to appease health conscious consumers by adding nutrition labels, however, if you look closely, you’ll see in many cases the calories don’t match the nutritional values provided on the label. The reason – alcohol isn’t a nutrient that is usually provided on a label, and since much of the carbohydrates are converted into alcohol only those not converted are accounted for on the label. Below is a label of Angry Orchard Hard Cider. We all know that apples are carbohydrates and we know carbohydrates is a fancy name for sugar. You’ll see that calories, carbohydrates and sugars are accounted for on the label, but if you multiply 31g of carbohydrates by 4 calories per gram, you get 124 calories, not 210. 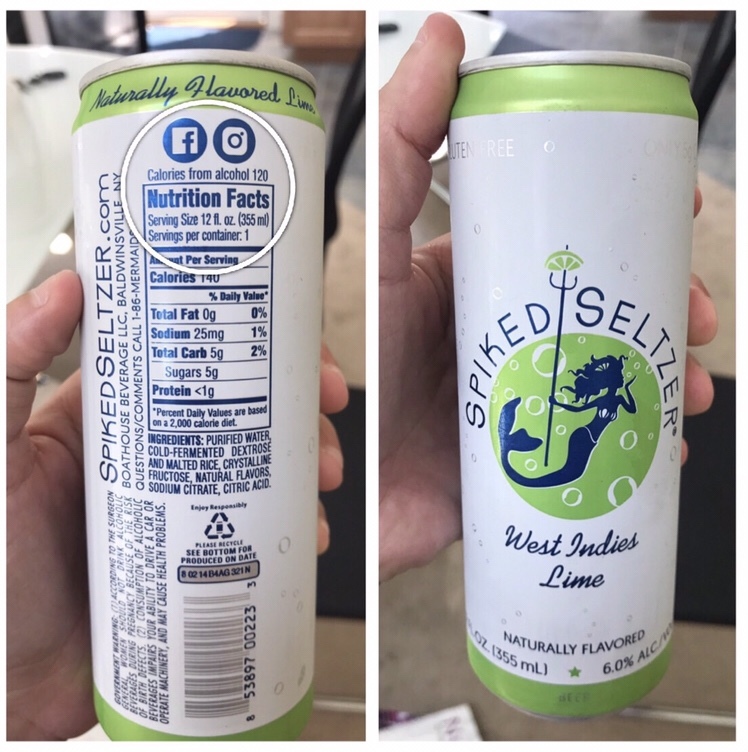 That’s not to say that there are truly 84 calories or 12g of alcohol in this bottle, but you get the idea – the energy is accounted for, but not the nutrient. This was in the fridge at JP’s parents house. Notice how it lists carbohydrates as 5g (which is 20 calories) and at the top it says calories from alcohol 120 (roughly 17g). I’m not sure if this is something that we will be seeing more of, but I do think it allows people to make more healthful decisions – nutritionally and psychologically. How do you track it if you’re counting macros? I recommended threeways to accommodate alcohol into their plan. 1. Since it’s chemically similar to carbohydrates, you can over-accommodate by taking the total calories of the drink and dividing by 4 calories (1g of carbohydrates) to determine how many grams of carbohydrates you would use to account for your drink. 2. Calorically, since they’re close to fats at 7 calories per gram, you can divide by 9 calories (1g of fats) and determine how many grams of fats you want to use to account for your drink. Both of these ways to accommodate alcohol aren’t going to be perfect – there’s no perfect way to account for it. Even if you’re counting calories, many people aren’t measuring all of the ingredients in their drinks and are estimating their consumption – especially if they’re ordering out. 3. The most common way I recommend they accommodate alcohol into their plan is to calculate it similarly to above and accepting and allowing themselves to eat in a surplus that day. I hardly ever recommend that clients substitute alcohol for food. 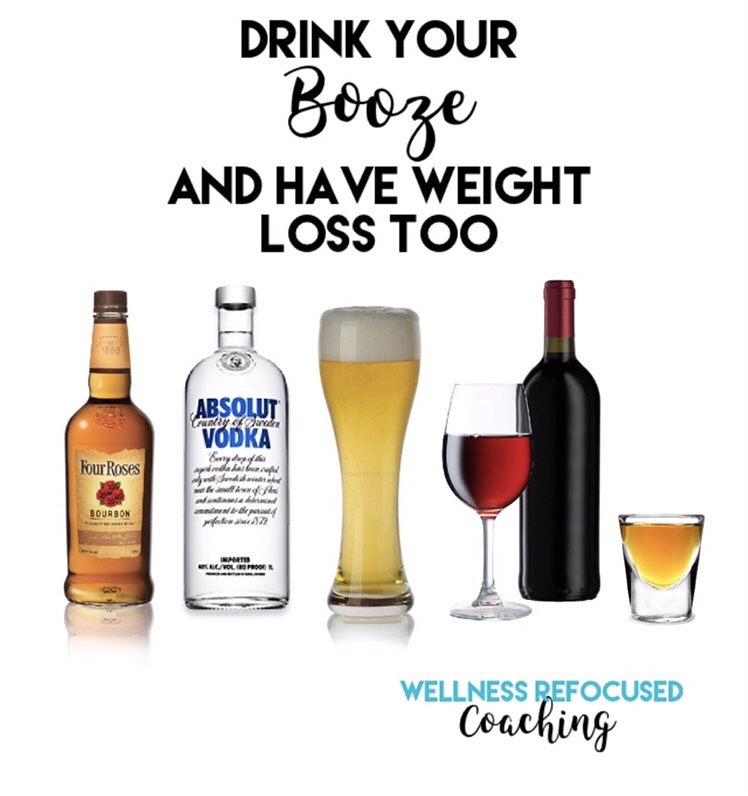 Not only is alcohol not nutritious but decreasing food will also amplify the impacts that alcohol can have on a body such as stimulant effects. Early in my journey, I made the mistake of attempting to leave space in my day for a drink to go out and it hits you like a ton of bricks if you’re not careful. Now, if I have a drink I’ve actively made the decision to have it and go over my calories for the day. This doesn’t mean that I load up and go over excessively. In many cases I’m putting my body into maintenance range, not necessarily a surplus. We’ve talked about how the body breaks down certain nutrients from complex to simple forms and we’ve talk about how some things are broken down at different rates. As a liquid, alcohol is readily absorbed from the both the stomach and the small intestine – it’s not digested before reaching these two organs (Thompson & Manore, 2015). Foods containing protein, fat and fiber help slow down absorption rates of alcohol and therefore slowly the effects of it. After alcohol enters the bloodstream, it moves to the liver where it’s broken down. The liver produces two enzymes that break down alcohol – alcohol dehydrogenase (ADH) and aldehyde dehydrogenase (ALDH) (Thompson & Manore, 2015). These enzymes break down alcohol so that it’s energy can be readily available to the body. After the energy has been made ready, the body only has two options – use it for energy if caloric needs haven’t been met or convert it to fatty acids and store it for later. While age, gender and weight can impact how alcohol impacts a person, the rate at which alcohol breaks down once it reaches the liver can’t be altered regardless of the myths out there. Why do so many people cut it out of their diets if you can still lose weight and fat when consuming alcohol? Again, there’s no nutritional value and it’s easy over consume energy through alcohol consumption. It’s not just from alcohol in beverages that the calories come from, many who enjoy mixed drinks are adding calories through sugary mixers and additions likes cherries and whipped cream. Other negative behaviors like over-eating as well as heavy drinking are also associated with alcohol consumption. It’s possible that there are some benefits to light or moderate alcohol consumption. Resveratrol is a phytochemical found in red wines, grapes and other plants that can play a role in limiting cellular damage and help lower risk of certain chronic diseases (Thompson & Manore, 2015). However, the amount of resveratrol in wines may be too little to make a meaningful impact and therefore a purified supplement of resveratrol would be recommended. Much research has found links between moderate alcohol consumption and lower chronic disease, but not causation. “Clinical studies are limited by their observational nature as well as for the difficulties to abstract the benefits of wine from other confounders” meaning that it can be hard to determine if the benefits were from the wine or other healthy positive behaviors (Artero, Artero, Tarin & Cano, 2015). There are clear risks to drinking too much alcohol such as higher risk of chronic disease like impaired bone health, pancreatic injury and diabetes, abdominal obesity, cancer. There is no recommended daily allowance (RDA) for alcohol, however, moderation per gender is encouraged. Moderation for women is one drink per day and no more than two drink per day for men. Similarly to deciding if you should have a dessert after dinner or an extra serving of what would be considered a treat, you should feel confident in the decision to participate. Having a glass of wine or a bottle of beer shouldn’t make you feel derailed or feel like you’re ruining progress. It should be accounted for in whatever way you believe will be helpful. If it’s moderating the rest of the day and acknowledging that you will be out of a deficit that day – then so be it. If it’s not counting it, but going about your day tracking other items – then so be it. Just don’t allow yourself to become out of control. As for me, I enjoy a beer with dinner. I like a cocktail when it’s hot. Sometimes I put liquor in my coffee when we make brunch. Artero, A., Artero, A., Tarin, J. J., & Cano, A. (2015). The impact of moderate wine consumption on health. Maturitas, 3-13. Thompson, J., & Manore, M. (2015). Nutrition: An Applied Approach. Boston: Pearson.